Get all three of Matthias Chang’s books that, together, explain not just why but how we have all been programmed for war by the military-industrial-banking complex. . .
. . . for only $55! That’s $35 off the regular price of $90! 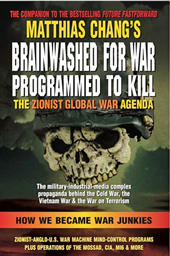 In Brainwashed for War, Programmed to Kill—the must-read companion to Future Fastforward: The Zionist Anglo-American Empire Meltdown—written by internationally renowned Malaysian author Matthias Chang, we learn that we Americans have been brainwashed for war our entire lives. From the Cold War of our youths to Vietnam and now the so-called “War Against Terror,” (including the war against Iraq and Afghanistan—and perhaps even Iran if we are not wary)—we have been lied to, mind-controlled, and duped by president after president (at the behest of America’s own intelligence services) with the goal of making us mindless supporters of bloody war. And how many of the wars of the 20th (and now 21st) century have actually been necessary for the defense of the United States? But again and again we support whatever war our presidents choose almost without question. It’s “kill the enemy” and “let blood be shed.” Tracing back four decades and more, Brainwashed for War documents the atrocities carried out by the imperialist, Zionist-driven forces whose goal it is to subjugate the peoples of the world. Replete with documentary evidence (including 200 pages of detailed and highly-readable, eye-opening classified documents), Brainwashed for Warexposes the vile propaganda warfare, mind control and brainwashing operations carried out by some of the world’s most powerful intelligence services in the world including the Mossad, CIA, MI6 and more, and how these operations have come to impact our lives even today. Discover the modus operandi of the Zionist masterminds and how they program the minds of the world’s peoples to support their goal of global dominion. Softcover, 521 fascinating pages, including charts, graphs and diagrams. Complete subject index. 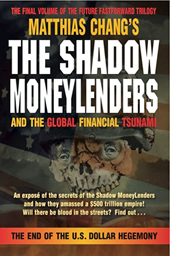 Matthias Chang’s new book, The Shadow Moneylenders and the Global Financial Tsunami, is the only up-to-date work that fully explains the corrupt nature of the international money monopoly and the role the funny-money Federal Reserve System plays in its perpetuation. . . .
Will America Be Compelled to Impose Capital & Exchange Controls? Abolish the Fed, Central Banks, and Taxation! What Lies Ahead—and What You Can Do to Protect Yourself! The words in this book are not written to shock the reader, but they do. Here is a view of the Force, namely, the invisible Zionist Anglo-American Empire, that acts on our very lives. The author makes a convincing case, complete with impeccable historical references, of plans put into motion many years ago to control the course of human life on earth. These plans have taken on a spectacular turn, as the architects have decided to fast-forward their agenda. The power elites of the Zionist Anglo-American Axis have been in control of the political systems throughout the world. There is not a single country in which their cunning and evil influence has not been felt. Their philosophy of “divide and rule” has manifested in various ways on different scales: the Cold War between Eastern communism and Western capitalism, managed conflicts in the oil-rich Middle East, aided by the creation of Israel, and the illusion of choice in apparent democracies. Wars are invariably used to abruptly change political systems, and never for the simplistic “good-versus-evil’”reasons so vociferously declared. Future Fastforward is authored by Matthias Chang, a Chinese Catholic, a barrister of 29 years, and former political secretary to former Malaysian Prime Minister Tun Dr. Mahathir Mohamad. The author puts forward his propositions with sufficient proofs and documentary evidence that demonstrate the rapid and irreversible decline of the Zionist Anglo-American Empire and a New World Map by the middle of this century. He puts forward his case with a viewpoint that hammers in an irreparable dent into the social, economic, and political myths promulgated by the West, and poses a formidable challenge to the Western media’s ongoing propaganda schemes. The Address to American Patriots at the 2006 TBR-AFP Conference in Washington, D.C.
Patriots gathered here today, it is with much regret that I cannot be with you in this historic city of America to participate in this landmark forum. But I know that when Michael Collins Piper reads out my message to you, he will convey my affections for the American Free Press, TBR, and my heartfelt thanks to Mr. Carto for his invitation and my admiration for his resilience in ensuring that the true voice of America is heard, not only in America, but throughout the world. Long may he and the American Free Press and The Barnes Review continue publishing. I am also confident that Mike will also convey to you my love for America and the American people. On receiving the invitation from Mr. Carto, I could not help but cast my mind to the Farewell Address of George Washington in 1796. I have read it so many times, and on each and every occasion, I found his counsel and wisdom more relevant and appropriate than ever. As we gather here, in the city named after him, it may be useful for us to recall just what this great American said. We in Malaysia are no stranger to the goodness of America and your free Constitution. Strange as it may sound, your Constitution has inspired a generation of freedom fighters in the third world following World War II and continues to inspire people throughout the world even as the United States is waging wars in Iraq and Afghanistan and threatening insane nuclear strikes against Iran and Syria. We don’t hate America and the American people, America is not our enemy. The Constitution and the Declaration of Independence shall always be a beacon of hope for those who are oppressed. What has disappointed us and continues to dismay the victims of war is that essentially, since World War II, each and every U.S. administration has in one way or another betrayed the U.S. Constitution and the exhortations of President George Washington. How did we, the people of the third world and our lands become the strategic interest of the United States? Why should our resources be controlled by U.S. multinational corporations? Why must we be made cannon-fodder for the Zionist Global Agenda? Why must Islam and its 1.6 billion adherents be demonized? In the present circumstances, are we, the people of the third world, not entitled to question the motives of your government when we see George Washington’s counsel totally ignored? Uncensored images on the disaster in Iraq must shock most of you. Just imagine what it is like to be on the receiving end, day-in, day-out, of laser guided bombs, cluster bombs, phosphorous bombs, senseless killings by death squads and tortures such as those in Abu Ghraib and Guantanamo Bay. But death does not discriminate; it kills all and sundry. Should not the body bags bringing home brave young men and women and those maimed for life move us to question the morality of policies that are grounded on the principles that might is right and wars are legitimate means to settle disputes? America lost over 50,000 of her bravest and most loyal in the quagmire of Vietnam. Over 2,500 have been slaughtered, and tens of thousands crippled for life in the Iraq debacle. And more will die in the years to come. How many more lives must be sacrificed before we wake up to the folly of the policies of the Zionist-inspired neoconservatives? How many more parents, wives and children must suffer the dreaded knock on the front door, not to welcome a visitor, but to receive the confirmation of the death of a beloved family member? I am not ashamed to admit in front of you that when I first saw the brutally deformed babies in the pediatric wards of various hospitals in Iraq – the result of depleted uranium radiation – and the wanton destruction and pain, anguish ripped through my guts and, as tears welled in my eyes. I prayed and prayed for strength to live through that horrifying day. And I vowed on that day that we must campaign to stop the killings. Tun Dr. Mahathir Mohamad, in the Perdana Global Peace Conference in December 2005, called on the world to criminalize war. If murder is a crime during peacetime in our society, killing in time of war is also a crime. If we are civilized, war cannot be an option in the settlement of disputes between nations. I plead before you, the good people of America, that you must reclaim America from the clutches of the Zionist-inspired neoconservatives. It is only Americans who can reclaim America and her Constitution. It is only Americans who can execute the plan laid down by George Washington who counselled us. “In the execution of such a plan, nothing is more essential than that permanent inveterate antipathies against particular nations, and passionate attachments for others, should be excluded; and that, in place of them, just and amicable feelings towards all should be cultivated. The nation which indulges toward another habitual hatred or a habitual fondness is in some degree a slave. It is a slave to its animosity or to its affection, either of which is sufficient to lead it astray from its duty and its interest. “Antipathy in one nation against another disposes each more readily to offer insult and injury … when accidental or trifling occasions of dispute occur … the peace often, sometimes perhaps liberty, of nations, has been the victim. The passionate attachment for Israel, more so in recent times, has brought untold suffering not only to the world but to America as well. It cannot be right for America to abandon her sacred “duty and interest” just so that Zionist Israel can be the regional hegemon in the Middle East. Not satisfied with the vision of Israel’s forefathers, Ariel Sharon declared that Greater Israel should extend from Mauritania to Afghanistan, and not from the Nile to the Euphrates. And so the killing, the heinous and barbaric massacre of the innocents continues unabated. World War IV has started. Another generation of brave young Americans will be slaughtered, denied the right to a full and rewarding life, the sacrificial lamb before the Zionist altar. “World War IV is a total war on a global scale. World War IV seems complex but keep in mind during World War III (the Cold War) while American forces fought North Vietnamese regulars and National Liberation Front (Vietcong) guerillas in South Vietnam, we also fought the Pathet Lao in Laos and Khmer Rouge in Cambodia. “From Greece and Yugoslavia to Korea and Vietnam and the Caribbean and jungles of South America, the Cold War involved a large number of nations and groups … The ‘War on Terror’ is no less complicated and similarly encompassing. This cannot be America’s agenda. This cannot be America that I know and admire. This cannot be the America of the American Free Press, The Barnes Review, The Spotlight, and the truth seekers that I have long admired, Harry Elmer Barnes, Willis Carto, Michael Collins Piper, Christopher Petherick, Eustace Mullins (whose life-long persecution by the police state is a disgrace to the Constitution), Col. Donn de Grand Pre, and many more. I have faith in the goodness and morality of America, of this great nation to do what is right. The peace and freedom loving peoples of the world await your decision. I have faith and the conviction that this gathering of true American patriots will decide correctly and reclaim George Washington’s America from the Zionist neocons. Wishing all of you every success in your deliberations. And I thank you for accepting this message from Malaysia. Matthias Chang served as the political secretary to former Malaysian Prime Minister Tun Dr. Mahathir Mohamad. In recent years, attorney Matthias Chang, one of the best-known trial lawyers in Malaysia, has emerged as a hotly controversial and always-outspoken figure in the political affairs of that Southeast Asian republic. Although a Christian, educated though his childhood years and on through law school in England, Chang is of Chinese descent in a country which is a remarkable ethnic amalgam of native Malays, diverse Chinese elements, as well as a considerable number of Indians (Christian and Muslim alike) and many, many other ethnicities. Having established himself as a well-known and highly successful attorney and entrepreneur, Chang entered public service for the first time in the closing years of the 23-year-reign of “The Father of Modern Malaysia,” Dr. Mahathir Mohamad, appointed by Mahathir to serve in the pivotal post as Mahathir’s Political Secretary. Today, following Mahathir’s retire- ment in 2003, Chang continues to serve as a confidant and advisor to the ex-Prime Minister who remains a major force not only in Malaysia but throughout South- east Asia and, indeed, the entire Muslim world, reaching every corner of the planet. A no-holds-barred critic of Zionism and global imperialism, like Dr. Mahathir himself, Chang is well-versed in American history and political affairs and is a fervent admirer of the real American tradition, not the distorted and twisted form of “Americanism” being promoted by the likes of George W. Bush and his neo-conservative handlers and their allies in Israel. With the publication of his first book, FUTURE FASTFORWARD, Malaysian attorney and diplomat Matthias Chang unquestionably established him-self as a front-line geopolitical strategist in the fight to derail the forces of global imperialism that are generally known as “The New World Order.” American Free Press had the distinct honor of releasing the first-ever American edition of that book, which had already been a bestseller in Chang’s native land. 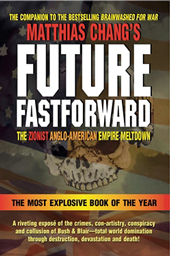 What makes Future Fastforward: The Zionist Anglo-American Empire Meltdown especially powerful and fascinating is that this is the first book critical of the New World Order and the Zionist-Anglo-American elite written by a former high-ranking official of a major foreign government to be published on American soil. And American Free Press has been honored by Matthias Chang with the opportunity to do so. The one author who predicted it all . . . and what is still to come . . . From the author of two of the most successful books in AFP history . . . The man who boldly exposed the Zionist-Anglo-American meltdown . . . MATTHIAS CHANG IS BACK! The no-nonsense author of FUTURE FASTFORWARD and BRAINWASHED FOR WAR is now laying bare the secrets of the global criminal enterprise he calls . . . THE SHADOW MONEYLENDERS.